Gray wolves (Canis lupus) are the largest members of the Canidae family. Highly organized and social, they live in hierarchical packs typically consisting of five to nine wolves. They inhabit prairies, forests, mountains, tundra and grasslands across the mainland United States, Alaska, Canada, Mexico and Eurasia. Their build, coat and other anatomical features are adapted to their rugged lifestyle. According to Animal Diversity Web, gray wolves' size depends on their habitat. Wolves in colder climates tend to grow larger than those in warmer regions. Gray wolves stand between 27 and 32 inches high at the shoulder. Adult males weigh 75 to 125 pounds and are 40 to 52 inches long from the nose to the tip of the tail, which makes up one-third of the body length. Females are slightly smaller: 50 to 120 pounds and 35 to 47 inches. Compared to a dog of equal size, the wolf's chest is narrower and its legs are much longer relative to body weight. The gray wolf's coat consists of a long, thick, water-resistant outer coat and a dense, insulating undercoat. Most gray wolves' coats are flecked in black and yellow. Variations include pure white, blond, cinnamon, brown and solid black. The fur on the wolf's back and sides reaches 2 1/2 inches in length, and its mane grows up to 6 inches. The mane is attached to erector pili muscles that force the hairs to stand on end, making the gray wolf appear larger than it is. According to Animal Corner, the gray wolf's paws are adapted for movement over varied and rugged terrain. The forepaws are slightly larger than the hind paws. Each forefoot has four toes and one dew claw, and each hind foot has four toes. The toenails are hard and blunt. Each toe and foot pad is encircled by insulating, bristly hair, and there is slight webbing between the toes. 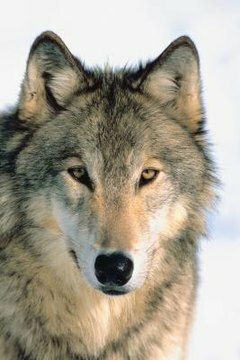 The toenails, bristly hairs and webbing all enable the wolf to move quickly and agilely over rough or slippery surfaces. The jaws of the gray wolf have approximately twice the crushing power of the jaws of a domestic dog of equal size, according to Wolf Sanctuary. Their elongated jaws accommodate 42 teeth, including four canine teeth that can grow as long as 1 inch. Their teeth are sharp, strong and somewhat curved, enabling them to seize their prey and bite clear through the bones, efficiently devouring it and leaving very little waste.